Susan and Todd had a unique rehearsal dinner experience. A festive taco bar was set up in the family barn for their friends and family courtesy of Simi De Salgado. 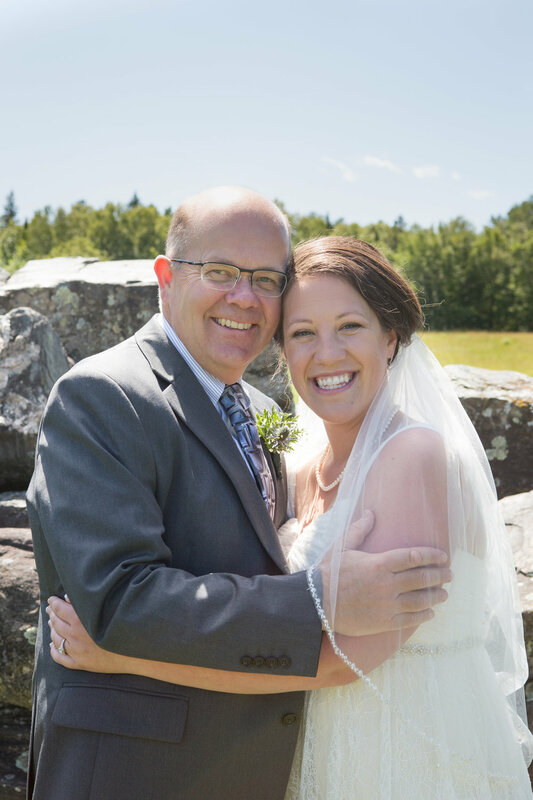 Todd’s dad, Chris, presented a beautiful video as a special gift for the couple. It was a mix of photos of Todd and Susan, some from their adventures together, some of their engagement photos and all the special moments in between. Todd and Susan were so surprised and appreciative of the gift -it moved Susan to tears. 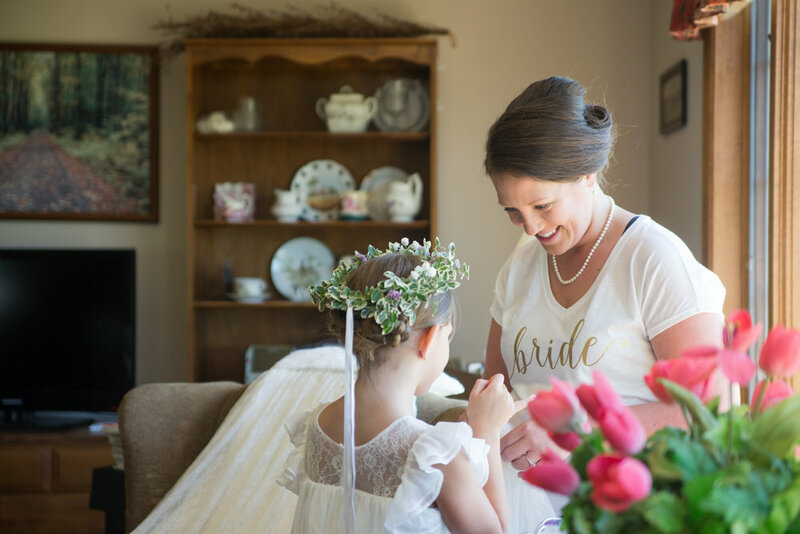 It was in this setting that they chose to hand out gifts to their bridal party. The gifts were thoughtful and everyone loved them! The girls were given glass jewelry boxes with gold lettering that held bracelets tucked around plush moss- the couple’s favorite green! 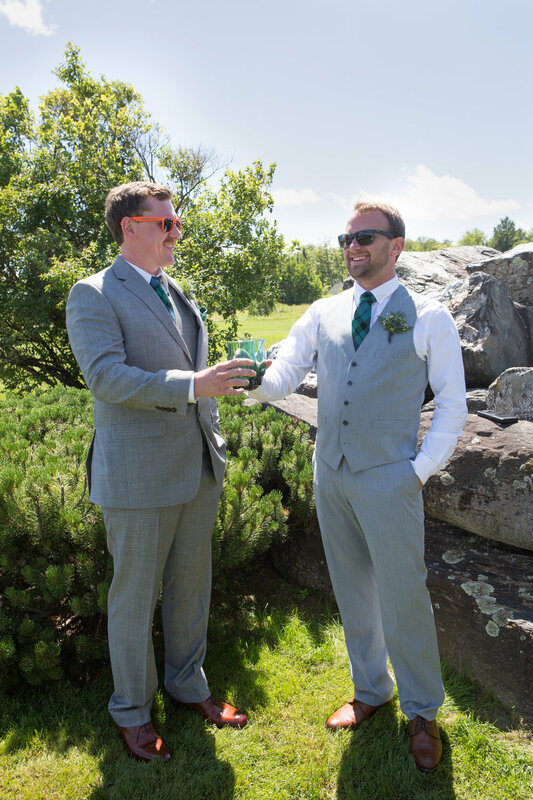 Todd presented his best guys with plaid ties & pocket squares to be worn on the wedding day, as well as a bottle of their favorite Irish Whiskey and daggers! After the festive meal was finished and the gifts were given, the party moved to The Katahdin- Greenville's very own steamboat. At 6 o’clock Todd, Susan, their friends, and family, coolers in hand, boarded the boat for a rock n' roll cruise. They spent the night together listening to live music, sharing drinks, dancing and celebrating the upcoming wedding! 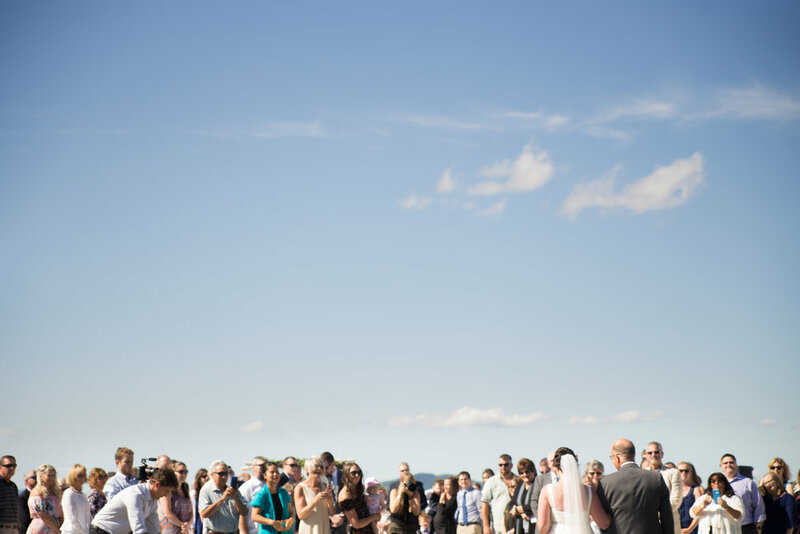 What a fun celebration of love these two had, saying good-bye to singlehood in style! 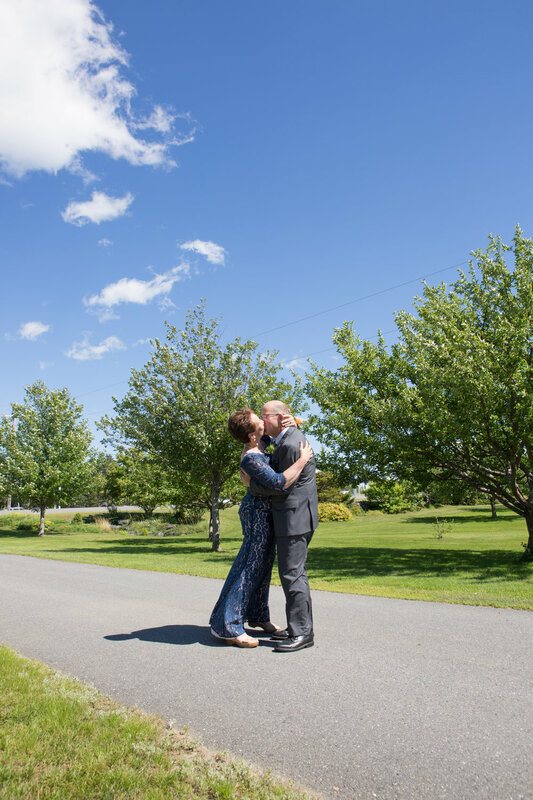 The morning of July 22 began with clear skies - a beautiful day to get married! Todd and Susan got ready together in Susan’s grandmother’s home as they prepared for the big day. 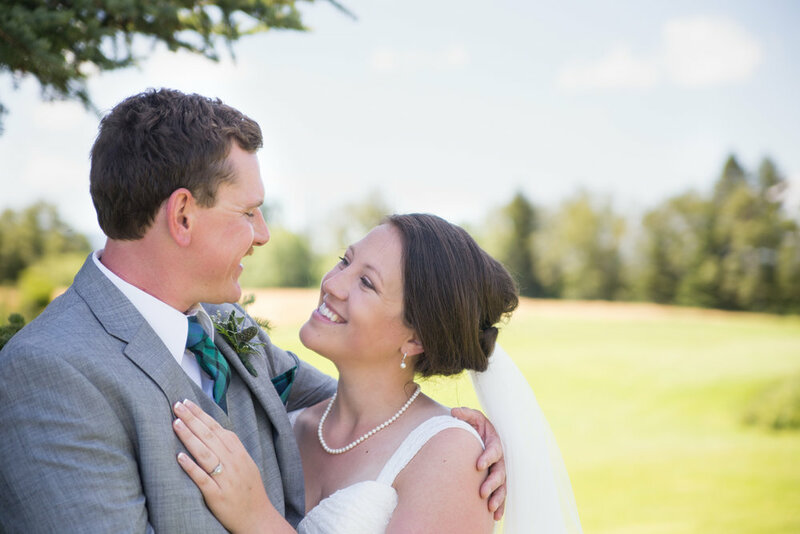 They wanted to enjoy their whole wedding day together from start to finish. When we arrived at Susan’s grandmother’s house, Susan was getting her make-up applied. She had the biggest smile on her face, “guys, I’m not a fancy person but this is fun” she exclaimed explaining her excitement! Her make up was perfect for her- light and simple to accentuate her natural beauty. Todd was glowing with excitement and always close by his soon to be bride. 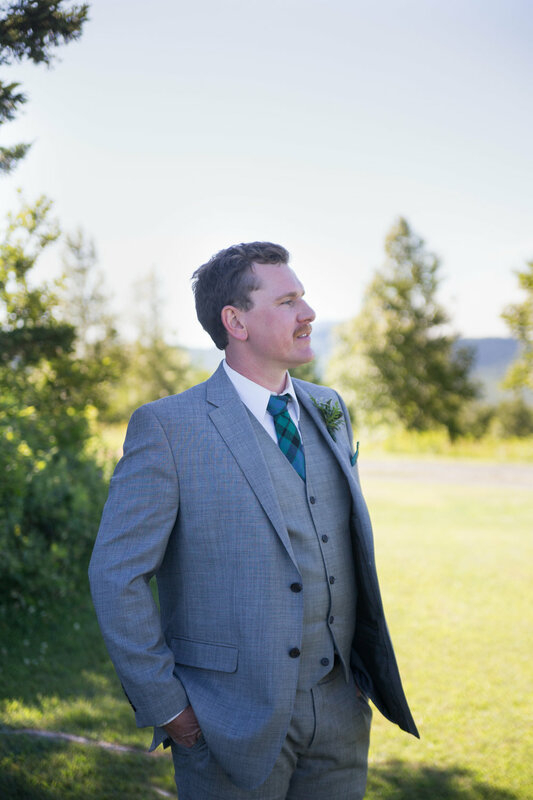 The elements that Todd and Susan added to their wedding attire were the perfect touch. 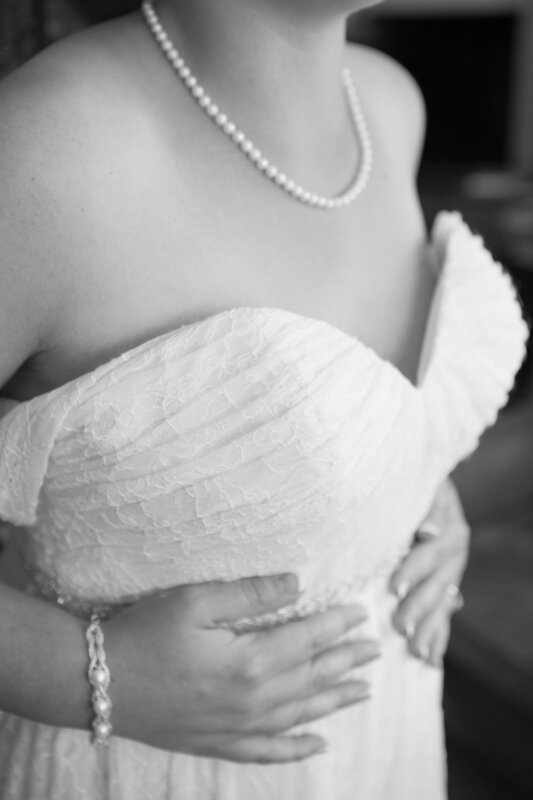 Susan wore pearls that, while simple, were elegant. They were a gift from her parents given on her sixteenth birthday. 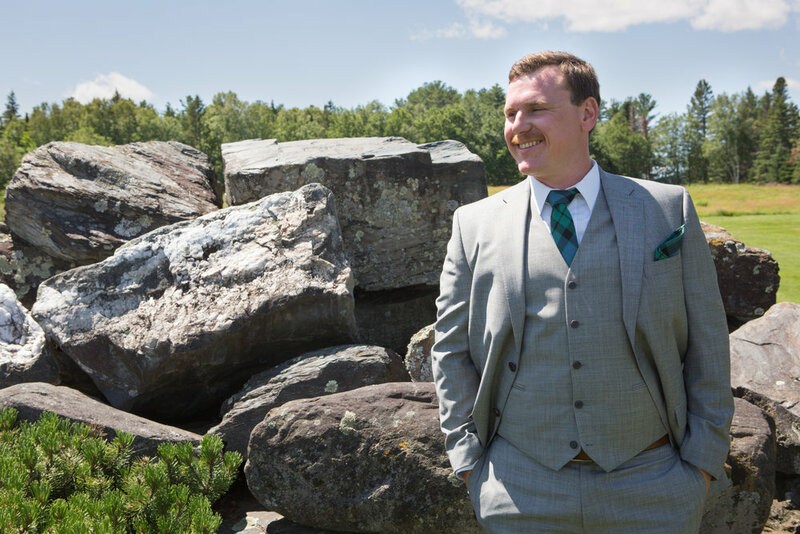 Todd (and his groomsmen) had on ties and pocket squares revealing his family’s Scottish tartan. It seemed, throughout the day, that even the smallest facets told a story about Todd and Susan. Susan shared with us a stack of notebooks explaining that each one was full of love notes that she and Todd had written to each other every morning. We even found pages where Susan practiced writing Mrs. Susan Martin! The latest one was written the previous night –sharing her excitement at becoming Todd’s wife. Todd and his groomsmen finished getting ready before Susan and her bridesmaids. This meant more time for photos and fun! They all made their way to the backyard where the sun was shining and the wind blowing. Todd’s groomsman, Alex, helped everyone tie their ties. 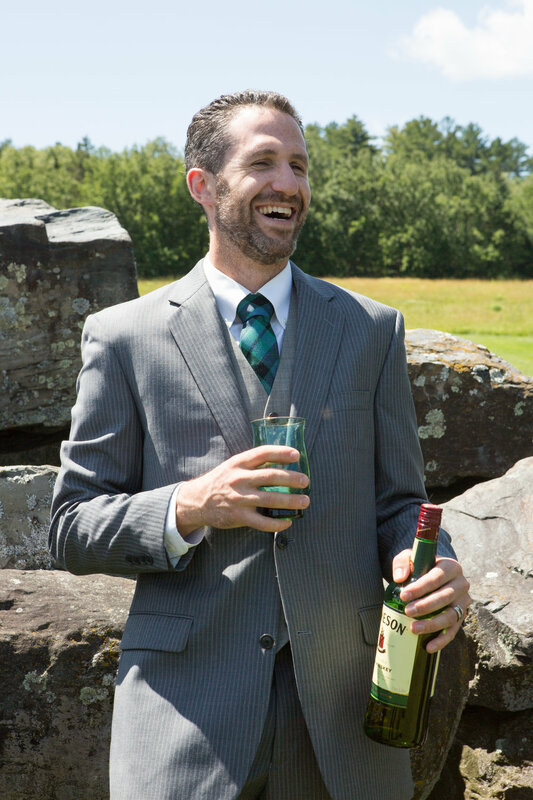 They laughed, joked and sipped on small glasses of Jameson as they shared memories and inside jokes. With the attire in proper positioning, it was time for photos. Each of the groomsmen took a photo with Todd. It was hilarious what they came up with –funny faces, silly poses and even an interesting yoga pose shared between Alex & Todd! Once the gents were set with photos they took the time to relax, while we caught up with Susan who was getting ready to put her dress on. Her parents- Laurie & Luke- came in dressed to the nines sporting large smiles and pride. Laurie put her husband’s boutonniere on and he returned the favor by slipping her corsage on her wrist. They made prom jokes before Luke scooted out so Susan could get into her dress. Laurie, Nola, Mya and Susan carefully placed the dress and accesories. 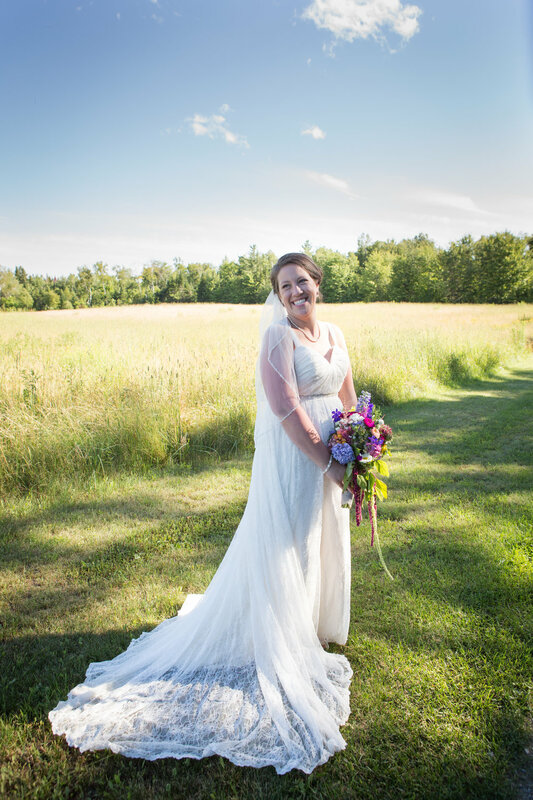 As she turned to reveal herself as a beautiful blushing bride, her brother John entered the living room smiling as he looked at his sister, “well you look good,” he said. With her wide smile Susan jokingly replied, “thanks -just getting married.” We laughed so much alongside this family all day! It truly was a gift for us to be there. It was now time for family photos with the bride- and of course the “Core 4!" The Muzzy’s refer to themselves as the Core 4--Mom, Dad, John and Susan, but with Todd they're now the "Fab 5!" The flowergirls stood in awe of Susan as she & her bridesmaids stood in the woods for photos before the ceremony. 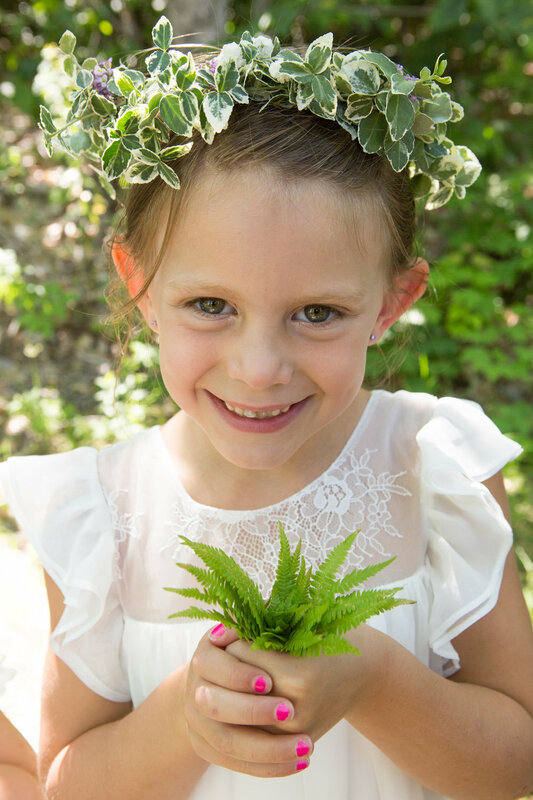 Mya and Nola, two of the most adorable and playful flower girls ever, carried her dress through the woods to avoid grass stains, sticks and dirt. 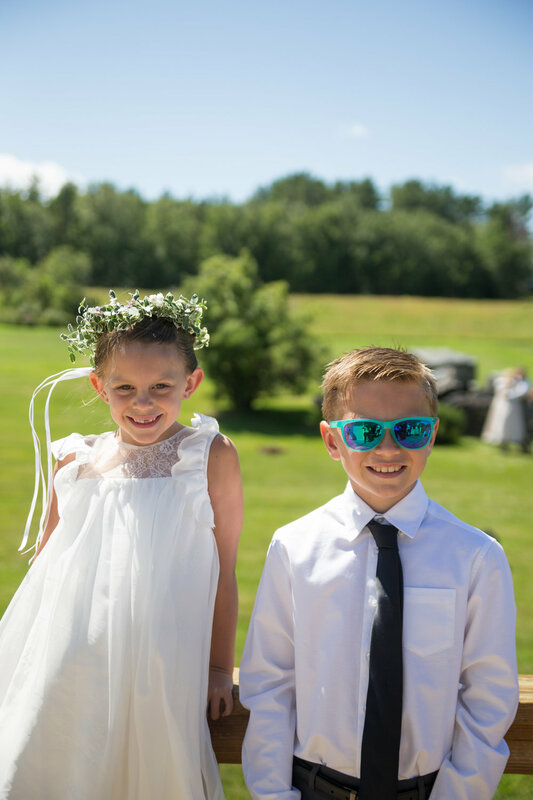 They were adorable and so excited to show off their job skills as flower girls. 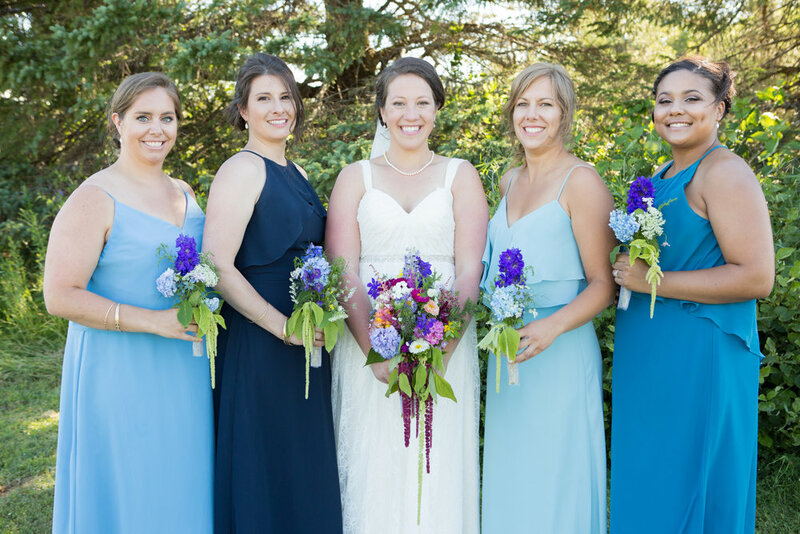 Susan’s Matron of Honor and her bridesmaids all wore different shades of blue. The colors all looked so beautiful next to Susan and among the trees. 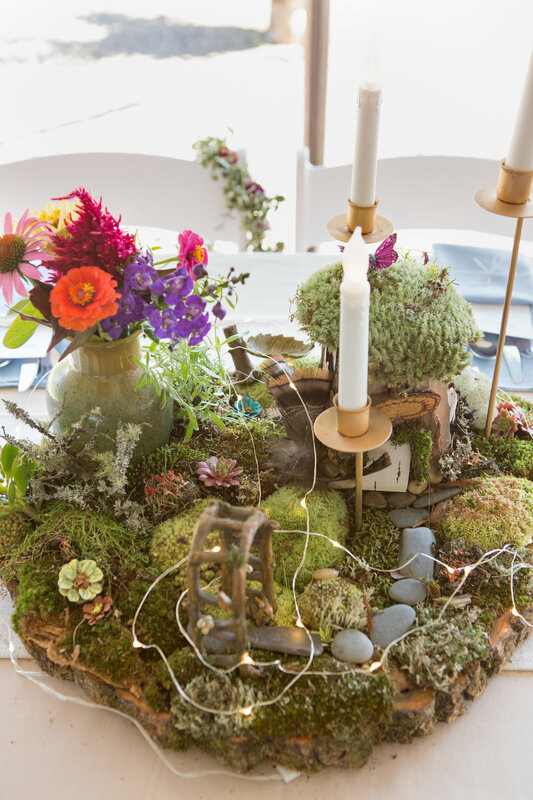 It suited the overall nature wedding theme so well. The ceremony took place “up back” on the Muzzy’s lot overlooking Greenville. There was a birch arbor atop the hill created by Todd and his friends. Todd, Susan and their wedding party lined up behind large trees just enough to not be seen but so that they were able to sneak glances at the guests and view! Luke, Susan’s dad, welcomed everyone to the wedding with an opening speech. He gave voice to the symbolism of being wed on this land which has been passed down through the generations. He expressed that Susan and her cousins had shared many memories “up back” and they were excited to add another wedding to the list of memories. Without further ado he welcomed the bride and groom and their wedding party. Todd’s Aunt Beth, along with a live band played “Love You Tender” as groomsmen escorted the bridesmaids down the aisle. Owen, the ring bearer followed next, carrying the birch tree that held the rings on pillows of moss. Nola and Mya, carrying tins filled with lavender, tossed it in the air as they trekked down the aisle. It gave off the most amazing earthy smell and fragrance for all to enjoy. Finally, Aunt Beth switched to “Simple Gifts” and Susan and her father walked down the aisle. 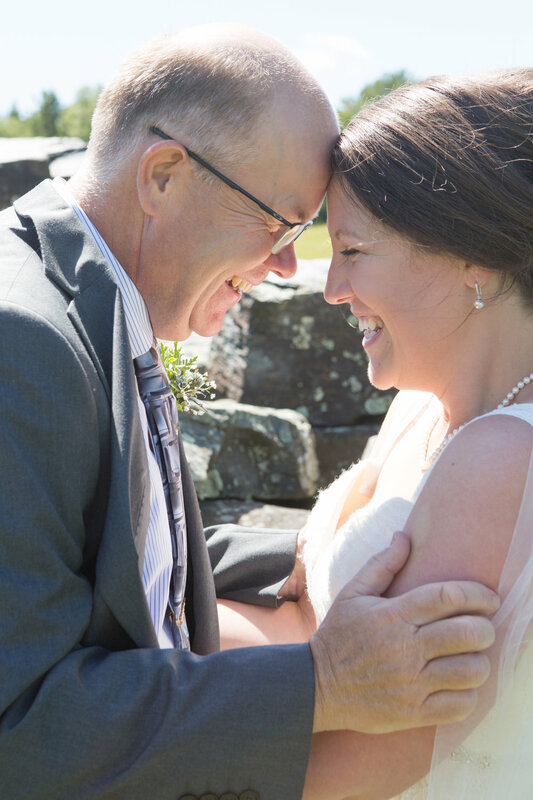 Luke was obviously in tune with how happy and excited his daughter was as she was marrying her soulmate. Susan’s smile was big and bright as she practically ran up the aisle to Todd-she just couldn’t wait to say “I do.” The wedding coordinator and Susan’s cousin, Jenna Overgaard, gave a few words explaining that the rings would be passed around for each guest to provide a blessing or a well wish to the couple. Jenna described to the guests the many adventures that Todd and Susan had together. They had explored many National Parks, Costa Rica, Iceland, and they were spending their Honeymoon in California! She said doing these things together is what is important. Todd and Susan have more than love shared between them - they're each other’s best friend & travel companions. Together they’ve truly learned the importance of also being yourself. The entire time they were at the altar, the couple could not stop smiling and making heart eyes at each other. And we couldn’t help but swoon over the moments happening either! 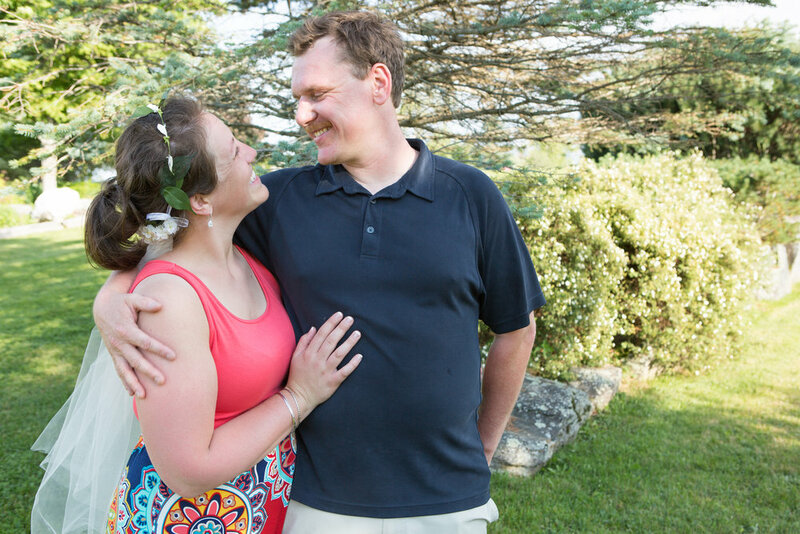 We cannot say enough great things about the love we experienced between Todd & Susan on that day. Susan and Todd’s vows to one another illuminated a beautiful picture of their relationship and their life together. Susan expressed that being with Todd brought her “the greatest peace and the happiest soul.” She mentioned that Todd had helped her appreciate spontaneity. She ended her vows with a smile, “I love you now and forever.” Todd was mesmerized by Susan.’s words. He began his vows saying he was madly in love with her, “you make me a better person.” He said he loved every moment they spent together. He spoke highly of Susan, explaining many of his favorite qualities, one being that she’s “a beautiful woman with a heart of gold.” Susan was beaming upon hearing his honest and kind words. They followed their vows with the exchanging of rings, which had made their way back to the alter. 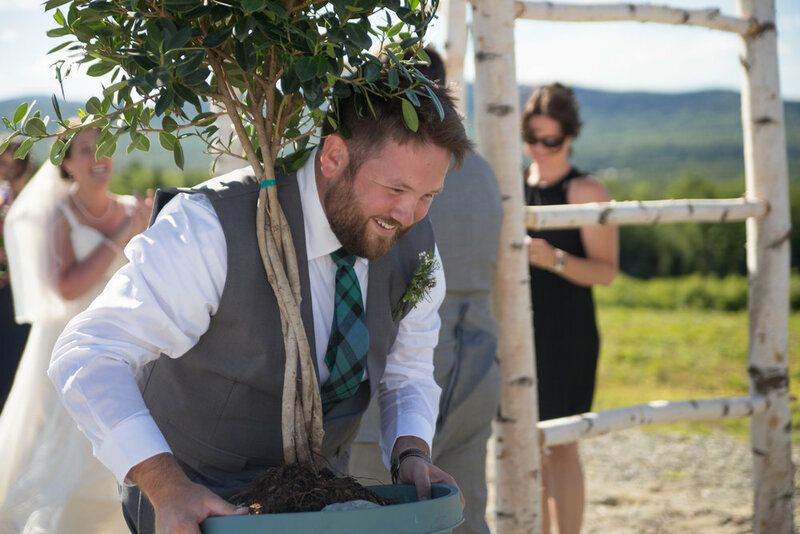 Todd and Susan chose to have a unity tree ceremony. Together they watered the tree which signified the roots of their relationship. Todd reminded everyone it was an indoor tree, with the intention that the tree could weather any storm because of its strong roots. And then all things aligned and the earth become an even better place the moment Jenna happily pronounced Todd and Susan as Mr. and Mrs. Martin! The two kissed adoringly before skipping up the aisle beaming at one another. The couple then had their formal photos taken. We adored that this was time they placed out for just the two of them. It meant for more intimate moments alone and to have that time to soak up their vows stated and the new rings placed. They were all smiles and laughter! They couldn’t take their eyes off one another as they posed for photo after photo, each one more adorable than the last. The more time we spent with them the more it became clear they were one another’s shining light. It was time to party! 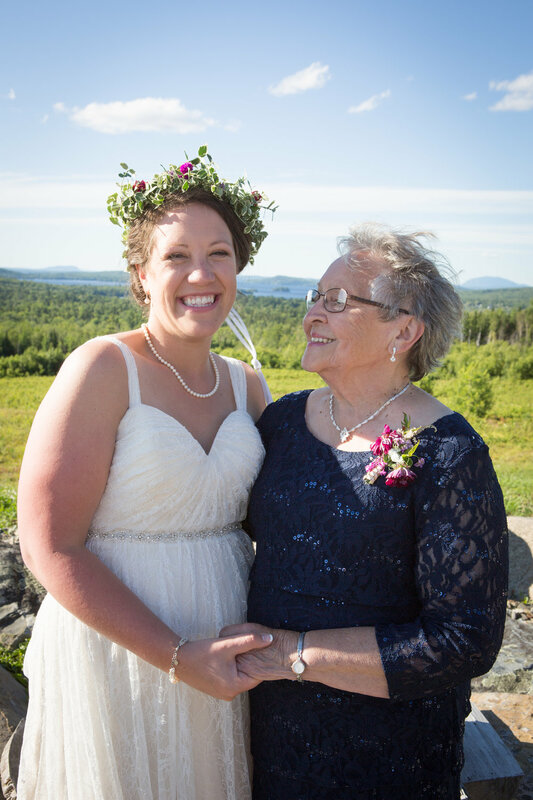 The reception began with Susan trading in her wedding viel for a flower crown perfectly made by Pat. There was beer on tap avaliable for guests with four different types of beers: Long Trail Green Blaze IPA, Peaks Organic Summer, Funky Bow So Folkin’ Happy, and Allagash White. 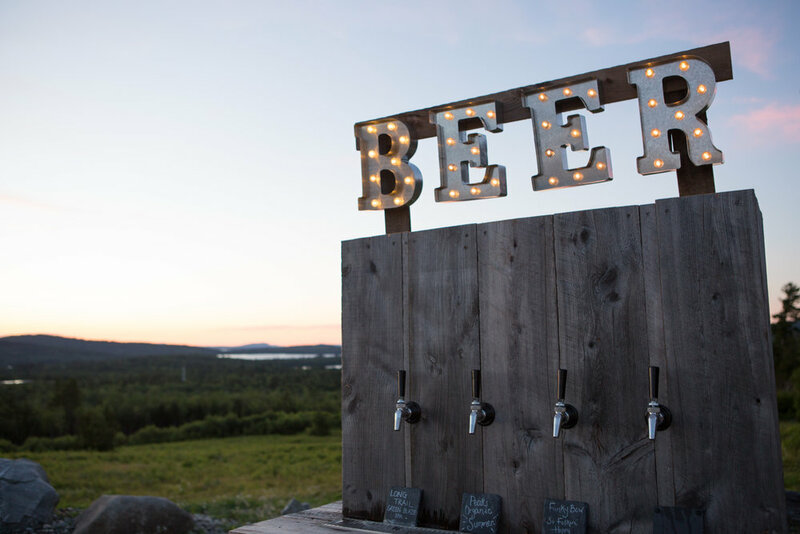 The guests loved this addition to the wedding! Inside the tent, there were fun -handmade fairy houses at every table and string lights hung everywhere. 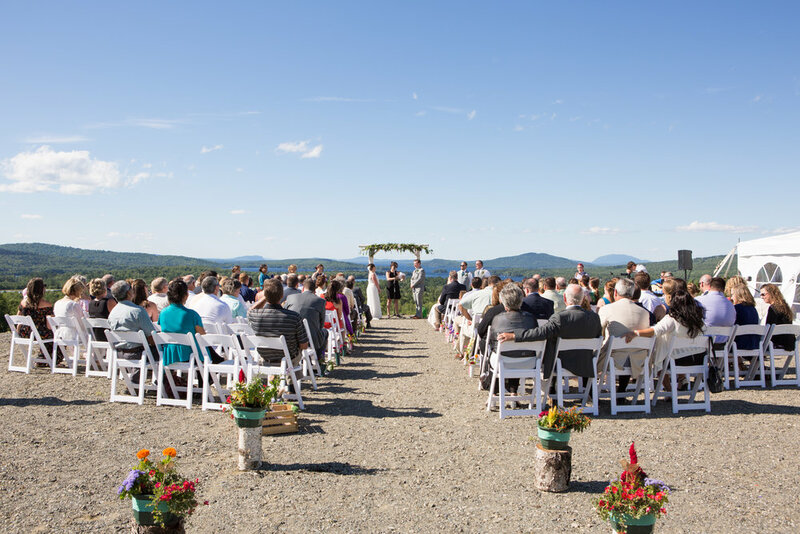 The beautiful decorations combined with the amazing view of Moosehead Lake made for an incredible earthy feel- we couldn’t seem to get enough! Susan and Todd started the night off with their first dance- some of Hannah’s favorite photos taken. Todd twirled Susan around, and they laughed and sang to one another. They were so caught up in their moment together, enjoying themselves, their eyes never left each other as they moved across the dance floor. Their song ended, and as another one started they invited all their guests to join them. Mya and Nola were happy to join Susan on the dance floor. They beamed up at her the whole time as they twisted, clapped and bobbed to the music. With everyone seated it was time for toasts from the Maid of Honor and Best Man. Susan’s best friend and Maid of Honor, Emily, took the floor first. She spoke of the first day she met Susan, they were suite mates at Saint Joseph’s College. She joked that Susan taught her that “spontaneity should be scheduled for an hour every friday.” She also said that Susan taught her about “boldly staying true to who you are.” Over ten years, the friends spent time together and enjoyed one another’s presence in their lives. 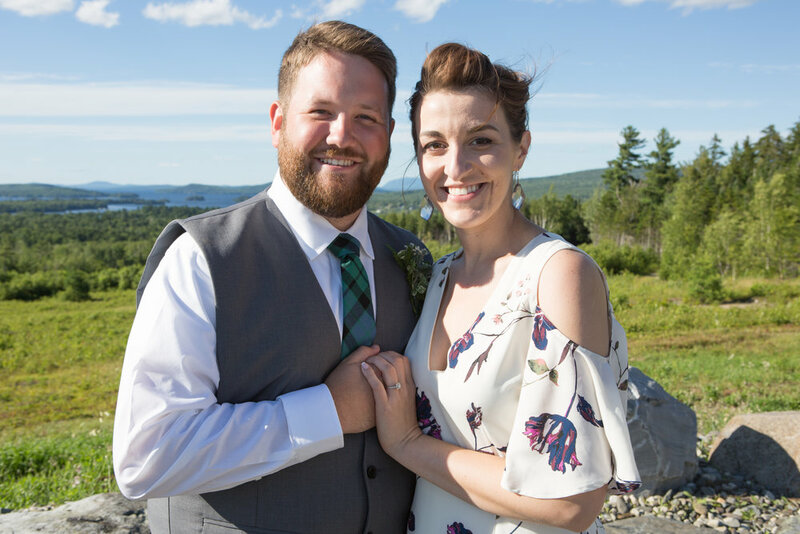 She shared that Todd brought out the best in Susan, and as a couple they “embody the cliche- be the change you wish to see.” Emily was clearly quite happy to see her best friend over the moon in love! Shortly after more wedding activities, Todd had a surprise for Susan. He put a chair in front of her at their sweetheart table, he pulled out his guitar, and dedicated the song to his beautiful wife. He then proceeded to sing, “You’ve Got Friend.” Susan was shocked, but so in awe of her husband and best friend. It was such a sweet moment enriched by a thoughtful surprise. Susan loved it- we all loved it. Way to go Chris & Pam- you should be so very proud at the man & now husband Todd has become. This moment was just another reason we will forever cherish the Martin wedding... for all this heart warming love and thoughtfulness. In a shout-out to John and Ali on their recent engagement the band invited all the couples onto the dance floor. Todd and Susan were lighting up the dance floor! They were having a ball as they enjoyed dancing with each other as well as their guests. It was time for another surprise! This time from Luke, the proud father of the bride. With all the guests and the bride and groom outside, the surprise kicked off in the distance... beautiful bright colors burst into the night sky -fireworks! Todd and Susan were amazed as they stood together watching the fireworks go off. They were wrapped up in each other and wonder of their surprise. Guests alike were enjoying the show. Once the fireworks finale lit up the sky, everyone headed back into the tent for dancing -the live band was incredible and kept the dance floor full. At one point, John got up and sang with the band and soon after so did Keisha. Musical talents on both sides of the family! What a fun experience! Susan & Todd had so many people singing for her! What a fabulous night. The band played on, the guests danced up a storm, and the new Mr. & Mrs. could not stop smiling. You two made us realize what every love song is about. This is one wedding we’ll be talking about for years to come! You both have shown us what soulmates look like. For you, we may have photographed and documented the big day, but for us- you gave us a gift we can never repay...reminding us of our WHY...why we do and love what we do. Forever grateful.